by the end of 2015. See http://www.nssc.natese.gov.au/training_packages. these publications will continue to address the content of the previous Training Package model. as they become more widely adopted. please check the many websites referenced within each publication. This material is available on request in appropriate alternative formats. and the instructions for gathering and interpreting evidence in an assessment process. 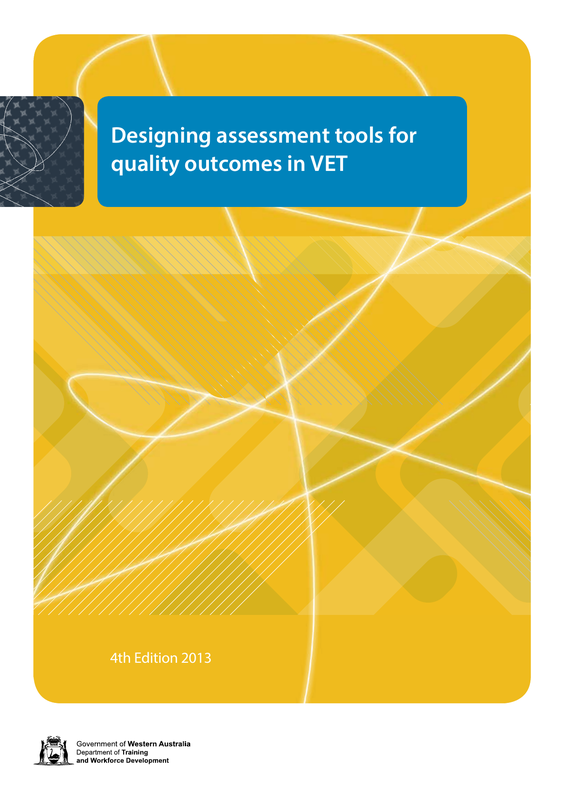 Australian Quality Training Framework (AQTF) or the VET Quality Framework. upgrade their tools of trade. judgements that lecturers make on the basis of that evidence. What is an assessment tool? 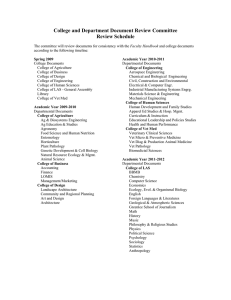 • the administration, recording and reporting requirements. often referred to as the assessment instrument. outcome is fully supported by the evidence gathered. • authentic – it can be verified that the evidence is the student’s own work. should be tested on an appropriate sample of students. and the ongoing testing and refining of prototypes. 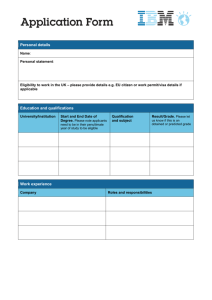 can be used flexibly and help you to make valid, reliable and fair judgements. Choose the most appropriate assessment methods. Design and develop the assessment tools. Trial and refine the tools. are ready to design a training program and select an appropriate assessment methodology. opportunities to cluster units of competency to reflect actual workplace practices. students. Students are assessed against standards that are clearly defined and articulated. requirements that may need to be considered when conducting assessment. or come from a clearly defined target group, such as an enterprise or an industry sector. order to design appropriate tools. requirements, using the following simple chart. as colleagues/other lecturers and industry/enterprise representatives. How will you gather the evidence? what they know. Students with a disability may need a bit more time to complete a task. all the requirements of the unit(s) of competency. needs and how you will use this information to customise your assessment process. literacy and numeracy (LLN) professionals to make this judgement. the quality of training and assessment you offer. Who will collect the evidence? Where will you gather the evidence? reconstruction of a business situation on a spreadsheet. opportunities for assessing whole work tasks or clusters of competencies. When will you gather the evidence? such as taking children to school. • stress placed on students and staff by your requirements. • fair (allow all students to demonstrate their competence). methods you will use, it is time to design the assessment tools. objectivity and transparency, and the student’s need for clarity and structure. decisions. They can also, if well designed, be used for recording and reporting purposes. • the resource requirements of the assessment. 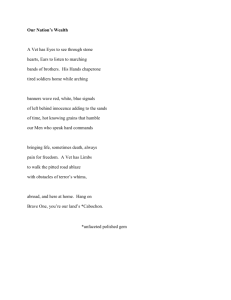 • authentic (is the student’s own work). the requirements of the units of competency when you design your tool. monitoring of training and assessment. skills or when seeking feedback on any tools that you have developed. Instructions for the student and the lecturer are an integral part of all assessment tools. working with students with a disability. instrument or in a separate document. The templates that follow use both approaches. 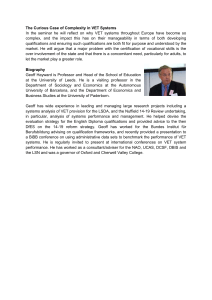 prior learning: An assessment resource for VET practitioners. • instructions to students and lecturers/observers. • application of workplace procedures, including WHS procedures. checklist or in a separate document. lecturers and students also need to be developed. range of customers with queries, problems and complaints. • resolving the customer’s complaint. and how do you manage them when you … ?). assist with interviews and also have to report on the outcomes? reporting to supervisors for further action. could jeopardise her safety and wellbeing. the career development role is a new role. instructions below have been developed for the key actor in your structured activity. audio recording, you should let students know so that they come prepared. • whether simulation meets the principles of assessment in the unit or cluster. workplace documents or advice on how to create a realistic simulated environment. teamwork, communication, occupational health and safety, and leadership. • Focus on processes as much as the end product. they would be in a real work setting. ensure the accuracy of the assessment approach. • Prepare an observation checklist that clearly outlines the critical aspects. • Consult with workplace/industry experts on what should be included. • Where practical, alter the training environment so that it reflects a real workplace. • Discuss the criteria against which their performance is to be assessed. • Where appropriate, video the student’s performance. gathered and help students to develop reflective skills. • Element 5 – Document and report emergency. up a small hazardous spill. designed for washing contaminants into a sealed drainage point. 1. Explain the purpose of the simulation and remind students of the assessment criteria. 2. Outline the scenario to the students. 3. Instruct the ‘clean‑up crew’ to put on the appropriate PPE. action ... ’, use the checklist below for the correct procedure. • determine the source and stop the flow of the liquid as soon as possible? (MSDS) for the next steps? • contain the spill effectively and safely? • cover drains that could be contaminated? • use the correct booms to contain spill? • wear appropriate personal protection equipment (PPE) at all times? • dispose of waste using the established procedure? • complete an environmental incident investigation report? • work effectively in a team situation with other staff? can be designed for completion by individuals or groups. 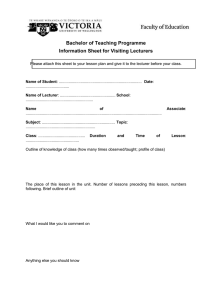 • instructions for students, including the timeframe and any other pertinent information. • oral or written examinations (may be applicable at higher AQF levels). • their understanding of workplace procedures, legislation and safety requirements. problems that may arise out of the work process. higher literacy, language or communication skills than those required for the job itself. Keep questions short and focused on one key concept. Ensure that questions are structured. Test the questions to check that they are not ambiguous. Keep questions clear and straightforward, and ask one question at a time. Use words that the student is able to understand. Look at the student when asking questions. Check to ensure that the student fully understands the question. Confirm the student’s response by repeating the answer back in his/her own words. questions and the kind of evidence being collected. Use a level of language that is suitable for the student. Listen carefully to the answers for opportunities to find unexpected evidence. make links between knowledge areas. Compile a list of acceptable responses to ensure reliability of assessments. his/her skills and/or knowledge to achieve the required competence. *Note: Exemplar responses can be recorded separately. and the people marking the responses, but the questions can be difficult to construct. longer time to complete and to assess. • Read each of the questions in the left‑hand column. • Place a tick in the box if you believe that you can perform the tasks described. that you perform these tasks.  Identify appropriate base course.  Install and compact base course.  Use correct bedding material. Have you identified the purpose of the test? for the purpose of the test? of the unit(s) of competency or their AQF outcome descriptors? 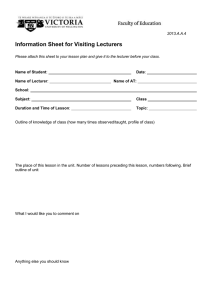 Have you used a variety of question formats? Have you estimated the marking time for the test? Have you assessed the level of difficulty of the test questions? Have you allocated sufficient time to do the test? Have you piloted these types of questions? Are there clear instructions for the student? they are easy to read? Have you included sufficient space for written answers? Have you considered creating a separate answer booklet? given explicit instructions and detailed criteria for evaluation. provide clear, unambiguous instructions for both lecturers and students. • how often entries should be made. assessment of the unit(s) of competency. and/or direct observation either on the job in the workplace or in a simulated environment. • What is a portfolio? • What should it include? • What place does reflection have in the portfolio? • What sections should it contain? • What supporting evidence should be included? • Who will have access to the portfolio, for instance, is it for public use? • What part will it play in the formal assessment of my competence? items compiled by students as supporting evidence of their competence. establishing the authenticity of the evidence. essential part of the assessment process. a period of time and some competencies are difficult to assess by observation alone. confirmed as the student’s own work. • the qualifications and experience of the third‑party evidence gatherer. provided/performed you are required to comment on? 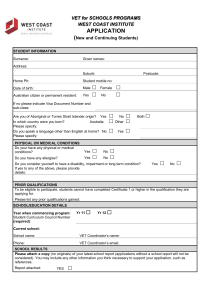 Are you aware that the student will see a copy of this form? in the area being assessed? perform job tasks to industry standards? solve problems on the job? cope with unusual or non‑routine situations? Identify any further training needs for the student. important that your tools are reviewed by fellow lecturers and trialled before you use them. any ambiguities or misunderstandings before the tools are used with students. and the tool’s overall cost‑effectiveness. students’ needs, while still ensuring valid and reliable assessment decisions. with fellow lecturers, through to industry‑wide validation by a panel of lecturers. available for use in making assessment decision. approved quality standards are met. • AVETMISS 6.1 for VET providers: what’s new and why? ApprentiCentre and the Careers Centre.